Facebook ad sizes and specifications in 2018 are slightly different than last year. 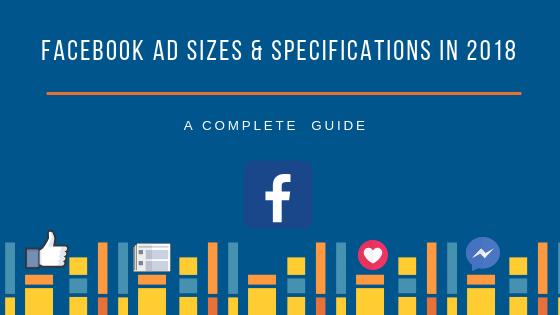 This guide aims to provide you with complete details on Facebook ad sizes and specifications that are required to create the perfect ad for your Facebook ad campaigns. Once you decide to set up a Facebook ad campaign, it can be quite time consuming to decide which ad will suit your campaign goals the best. As ultimately, it is your ad that engages with your target audience, you cannot get this step wrong. Mentioned below are the Facebook ad sizes and specifications in 2018 which can come handy in picking out the right Facebook ad. Facebook offers 5 types of ad formats to choose from for your campaigns. Single image ads feed are popularly used for brand awareness campaigns. You can use your single image ad in up to 6 ads into one ad set. It also fits in most ad placements that are available. The single image ad size for Instagram is different. So create a separate ad for Instagram if you choose to run your ad on Instagram as well. Instagram Image Size: 1080*1080 pixels. 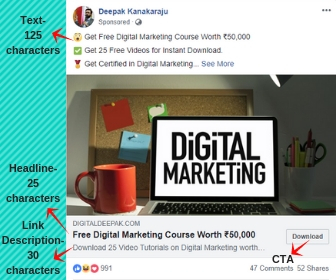 How many characters should a Facebook single image ad have? You should not include more than 20% text on your ad image as this might reduce your reach. View the Facebook Ad Text Guidelines here. You can also include a link in your single image ad. Panorama and 360-degree views are also supported. There is no maximum image resolution limit so you can use an image with the highest possible resolution. Some great images to use are people using your product, images that tell a story about the product or the people behind your organization or product. If you do not have the time or resources to make a video ad, Facebook slideshow ads are a great alternative. You can use 3-10 images in your slideshow ad. Facebook also offers 6-15 second long templates which you can use for free to create your slideshow ad. The maximum length of a Facebook slideshow ad is 15 seconds. You can also add music to your slideshow ad. An added benefit of using Facebook slideshow ads is that you can use them to use people who have slower internet connections and old devices as they use 5 times lesser data than video ads. Take a look at some Facebook slide show success stories here. Carousel ads are one of the most popular ad formats on Facebook. 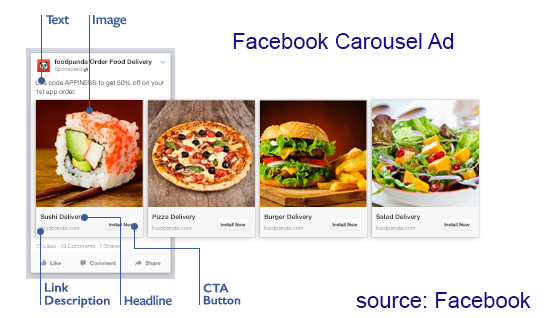 Carousel ads contain a set of scrollable images and are highly interactive in nature which is why they are one of the most preferred ad formats on Facebook. Take a look at some great Carousel ad examples here. Facebook carousel ads are a great way to showcase your product range. You can display a different feature of your product on each image card. You can use a minimum of 2 and a maximum of 10 images in your carousel ads. You can put a different link in each image card. Videos are the most popular form of content on the internet. According to Statista, the revenue generated in the Video Advertising segment amounts to USD329 million in 2018. This revenue is expected to grow to a whopping USD 1,265 million in revenue by 2022! How long can Facebook video ads be? Ensure your video thumbnail image doesn’t have more than 20% text on it as it might result in your ad getting a lower reach. Facebook is more popularly used on mobile and the audience on Facebook prefers watching short videos. So, video ads that last up to 15 seconds are a great choice. You can also choose to place your video ad either in-stream video ads, pre-roll, mid- roll on the Facebook audience network besides the usual Facebook feeds, Instagram and Instagram stories placements. Follow this link to view the complete sheet of Facebook video ad specs in 2018 for various ad placements. Here’s a detailed list of all the video formats that are supported by Facebook for your reference. Do add sound to your videos to make them more interesting to view. Canvas ads were launched by Facebook 3 years ago with the aim of gaining a high level of engagement from mobile users. Now they are known as “Facebook Instant Experience”. Facebook canvas ads offer a full- screen viewing experience on the mobile phone when clicked upon. Viewers of the ad don’t have to leave the Facebook app to view the ad. Your canvas ads can include images, GIF’s, videos and call to action buttons that allow your audience to click on, tap and engage with your brand in the Facebook app itself. Facebook canvas/ instant experience ads are a great way to showcase your products in a grid format which makes it easier for the viewer to be able to see the different products you have to offer. And the statistics state that 53% of those users who view a canvas ad on Facebook view at least half of the ad. The average time for which a canvas ad is viewed on Facebook is about 31 seconds which is pretty good! The video and image guidelines are the same as mentioned above in the respective sections. You can also build your canvas ads using Facebook’s free tool as well. It is a complete drag and drop interface with no knowledge of coding required.